All our products are reusable and of an outstanding quality. Once you’ve tried NoStik, disposable products will become a thing of the past. You can cook healthily with NoStik: thanks to the excellent non-stick coating, you don’t need butter, oil or other fats when cooking. 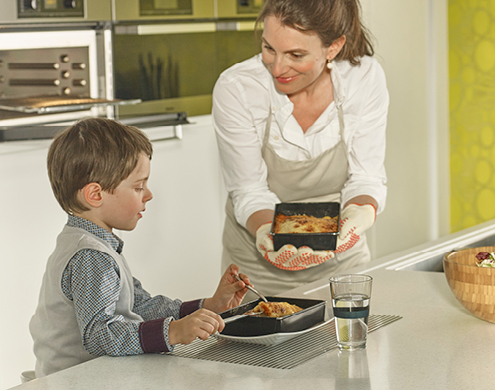 Not only do NoStik reusable baking and protective liners save you dozens of metres of traditional parchment paper, our cooking and household products are also well known for their very fair price to quality ratio. With NoStik you can fry, grill and toast delicious dishes without worrying about food sticking. No more scrubbing afterwards either: your oven, toaster or hob stays spotless. My toast bag was damaged during use, how did this happen? Depending on the brand of your toaster, the heating elements may or may not be positioned close to the toaster openings. It is important that the toast bag does not come into contact with the elements, or they may burn a hole in the bag. The bag itself is not flammable, so don’t worry that the bag will catch fire. Can I use NoStik® pan foil in a non-stick pan? Yes, you can use pan foil in a non-stick pan. However, make sure not to overheat your pan. How do I prevent the foil from sliding around in the pan? To ensure better adhesion of the foil to the pan you can sprinkle some drops of water or oil in the pan before lining it with the foil. This improves the contact between the foil and the pan, sealing the foil to the pan for better heat conduction. Is Teflon® bad for your health? No. Confidence in the safety of Teflon® coated products is based on more than 40 years of laboratory testing. The safety of Teflon® coated products has been confirmed by the US Food & Drug Administration (FDA), by extensive testing in the laboratories of The Chemour Company, and by millions of satisfied consumers in countries all over the world who have purchased and used Teflon® non-stick products for over 40 years without health effects. For what can I use the NoStik® products? Our range consists of several products for various applications. We offer products that are used with all types of ovens, frying pans, toasters and contact grills, as well as a range of handy kitchen accessories that will make your life easier. Take a look at our website and find out more about our comprehensive product range.